in the summer of 2011. 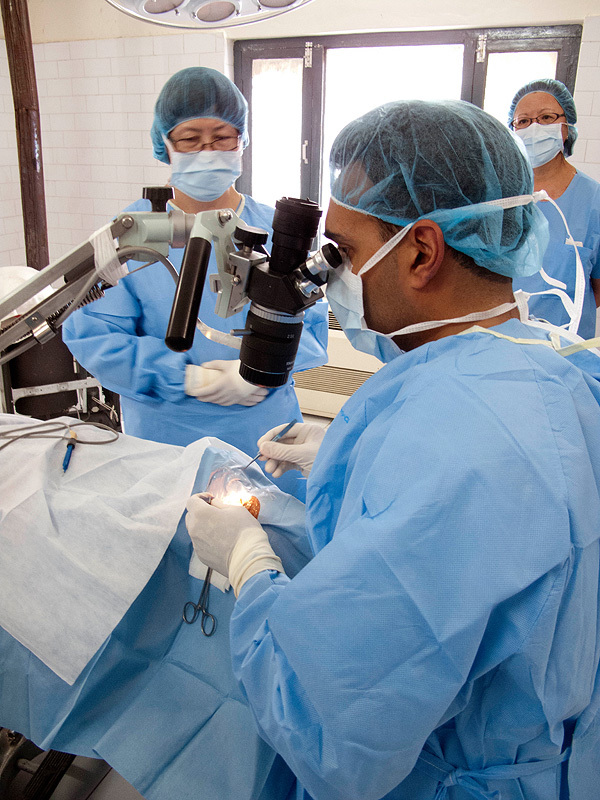 A talented and diverse team of 33 dedicated surgeons, ophthalmologists, optometrists, physicians, gynecologists, nurses and a virtual army of local and international volunteers provided excellent quality vision and women’s health care examinations and treatments for over 4,000 patients in little over two weeks time. 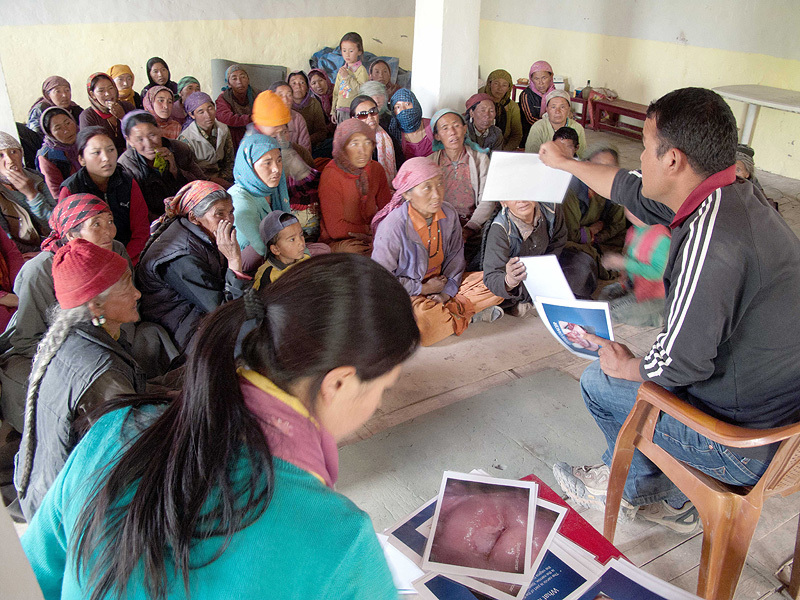 Based on post-expedition analysis from the spectacular results of the 2010 team, it was decided that the 2011 mission statement would be to accentuate wide scale vision and women’s health care for as many people as possible living in the remote Nubra Valley of Ladakh. In particular, the opportunity to have a break-through impact in the long neglected field of women’s health care was at hand. 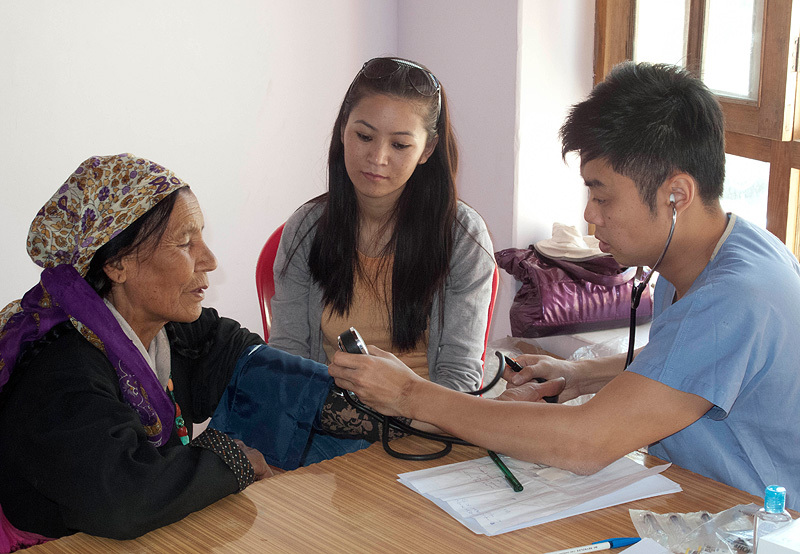 For the entire year following the successful Himalayan Women’s Health project clinic in 2010, the extraordinary efforts of our Ladakh based ally physician Dr Nordan Otzer made a historic impact possible. Doctor Nordan tirelessly traveled by foot to each of the 35 remote villages in Nubra Valley and did presentations for the local women on the basics of their reproductive anatomy as well as advocating regular screening as an imperative intervention in the epidemic rate of cervical cancer among the female population of Ladakh. 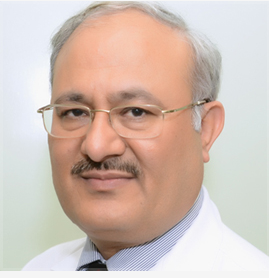 Because of his efforts and announcements on All India Radio, the women of Nubra Valley enthusiastically awaited the arrival of the international gynecology team that traveled to Disket in August 2011. The team of 33 dedicated physicians traveled from Singapore and the USA with an enormous amount of diagnostic and treatment equipment, supplies and capability. After arriving in the capital city of Leh, we once again needed to transport the team over the highest motorable road in the world to Nubra Valley. 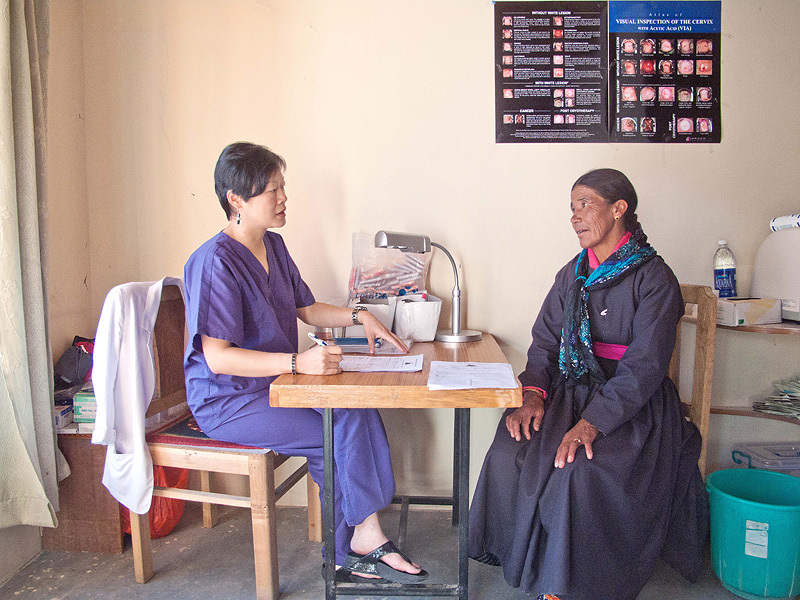 The Himalayan Women’s Health Project team of gynecologists set up a private clinic that had separate stations for registration, screening, treatment and education. This was located at a guest house compound that afforded privacy and singular focus. The team of four optical surgeons and a full support nursing staff were stationed out of the local hospital where they operated on patients utilizing the two OTs and patient wards. 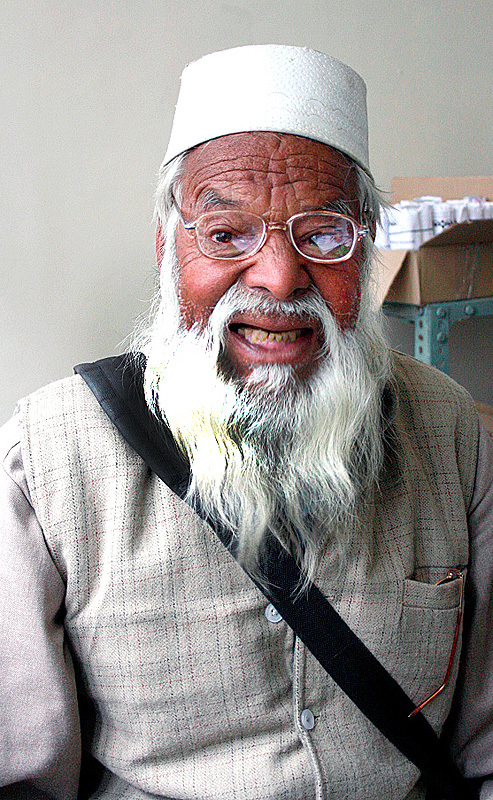 Dr Nordan's heroic efforts to journey to each of the 35 villages of Nubra Valley in order to educate the local women in basic women's health care and also urge them to attend the 2011 Himalayan Women's Health Project camp in August 2011 produced an overwhelming and historic response. Over 2,000 local women travelled from as far away as 100km to attend the camp and receive what for many of them was the first gynecological examination of their lives. 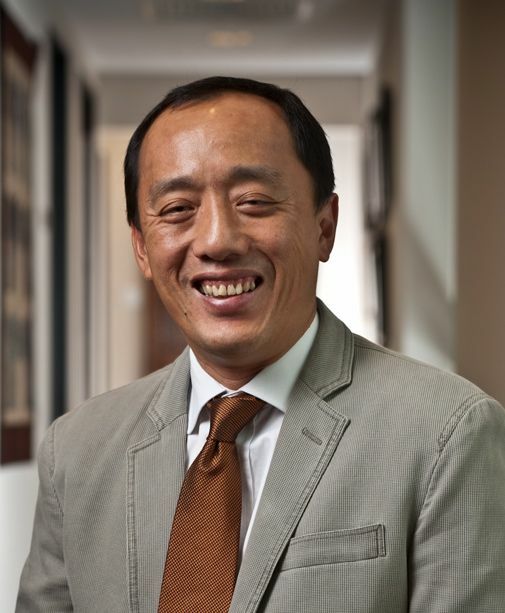 Dr Chua Yang (pictured), Dr Swee Chong and Dr Veronica Ventura teamed together with local gynecologists, nurses, health care workers and volunteers to tirelessly endeavor to exam and treat as many of the women who had travelled so far as possible. Often working 12>15 hours a day, the women's health care team provided excellent personalized screening and treatments for almost 2,000 women. 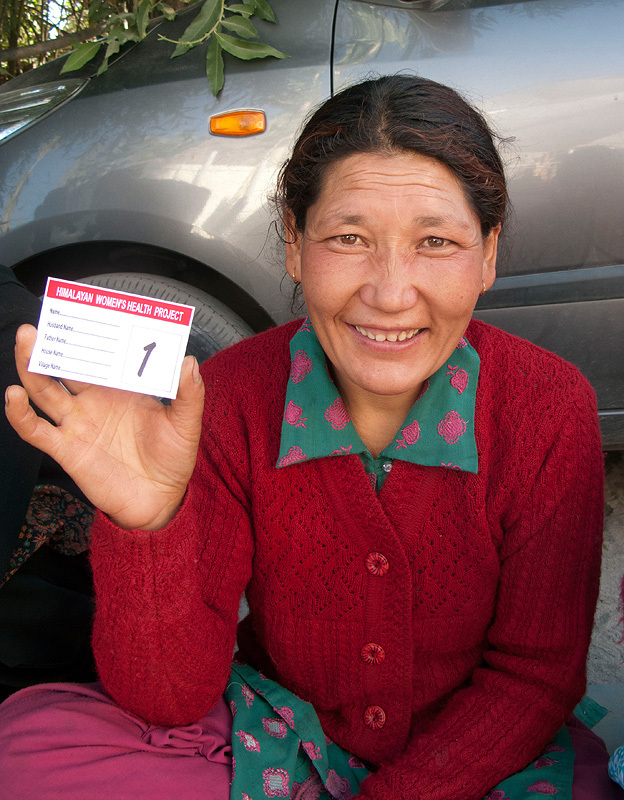 These numbers represent almost 50% of the entire female population of Nubra Valley. 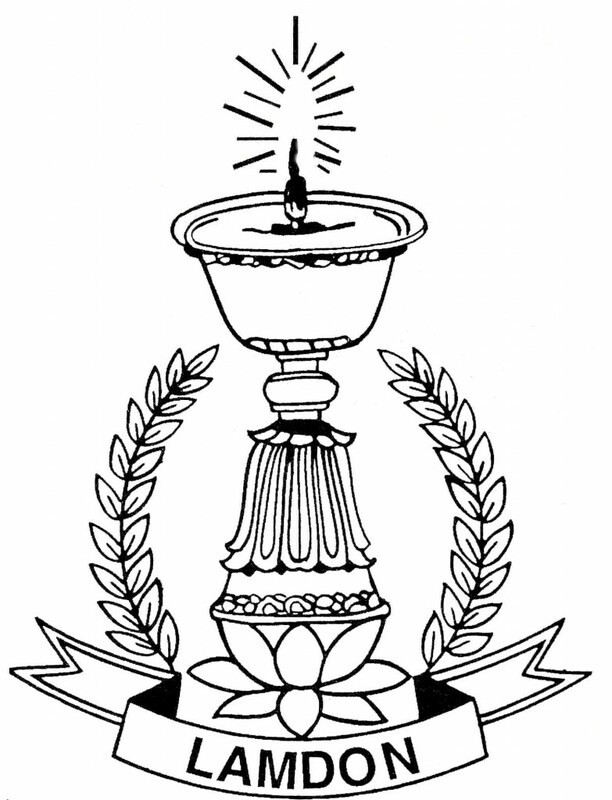 It was a historic breakthrough and monumental success on every level. A major component of the overall mission statement was women’s health care education. Dr Swee Chong conducted daily lectures and discussions with hundreds of local women before and after their examinations and treatments. Working together with the local doctors and nurses provided translation capability as well as to encourage the local woman to continue to come in to see their local physicians on a regular basis. 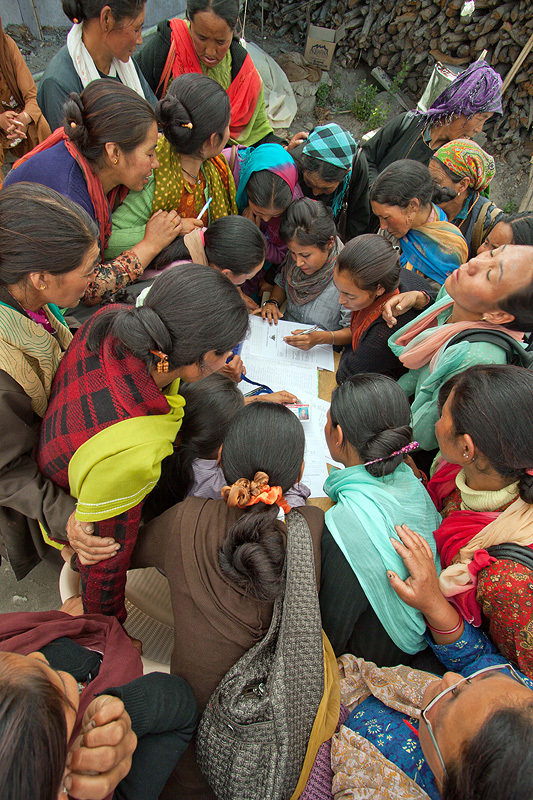 During the 7 day camp almost 2,000 women where screened and received treatments and vital information. Approximately 100 women were diagnosed with pre-cancerous lesions. The skilled surgeons performed many relatively minor excisions and biopsies of these women and the vast majority were considered cured of their potentially serious conditions. Three women, however, were found to have advanced cases that required major surgical procedures. We made all necessary arrangements for them to be flown down to New Delhi along with their husbands and they were admitted to the excellent facilities at The All India Institute of Medical Sciences. There, they received wonderful care led by the head of the women’s health department at the hospital Dr Neerja Bhatla. 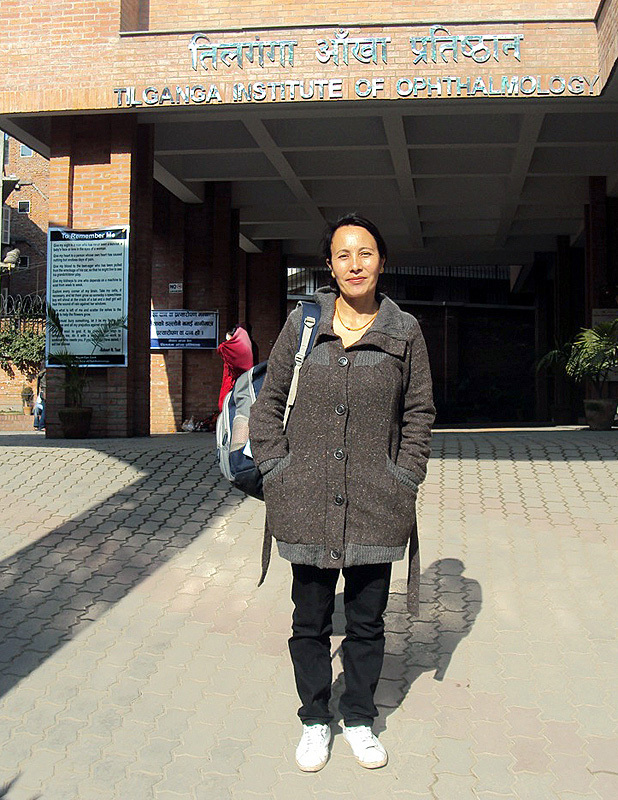 Dr Bhatla has committed to being available to extend the full capability of her skills and the AIIMS hospital to provide surgical care for Ladakhi patients who’s conditions require more complex treatments and procedures than are available in Ladakh. 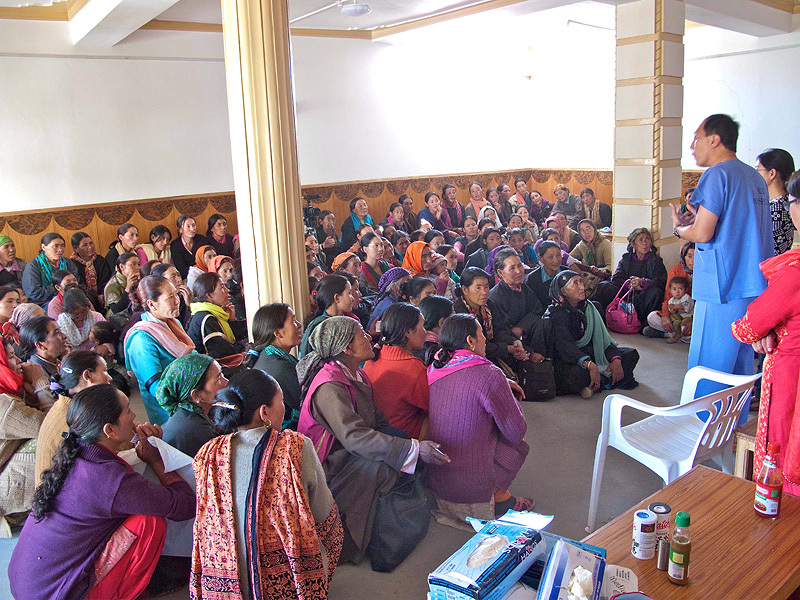 Dr Nordan will continue his efforts to journey to each village on a regular basis to continue the positive momentum established with The Himalayan Women’s Health Project. 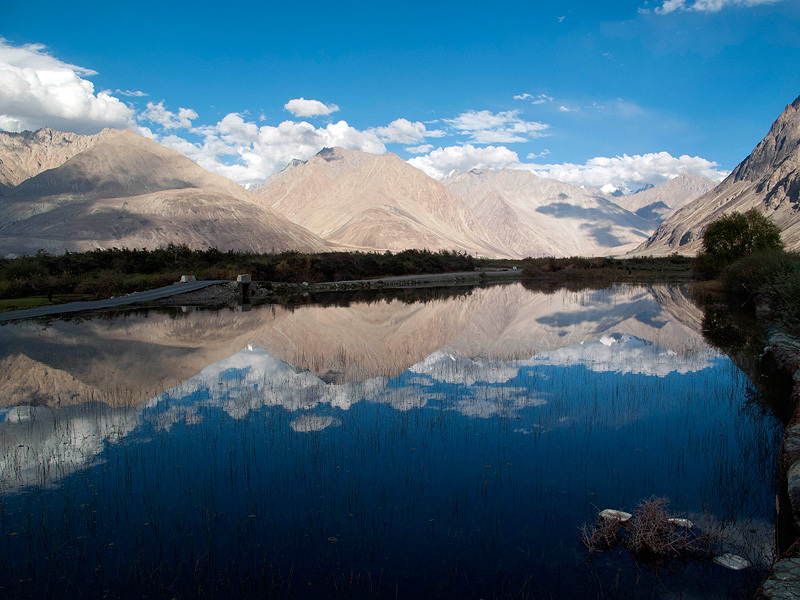 As a result of the enormous benefits shared with the people of Nubra Valley in 2010 as well as daily announcements on All India Radio leading up to the arrival of the vision team, hundreds of local people travelled to Disket to be examined and treated by the 25 doctors. 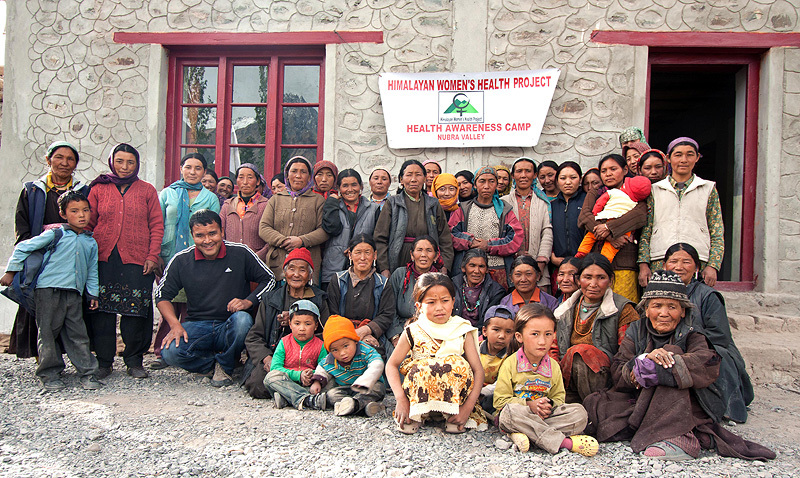 We set up the 2011 Himalayan Vision Project camp at the local Lamdon School which provided 14 separate classrooms that were converted into individual clinics and treatment stations. 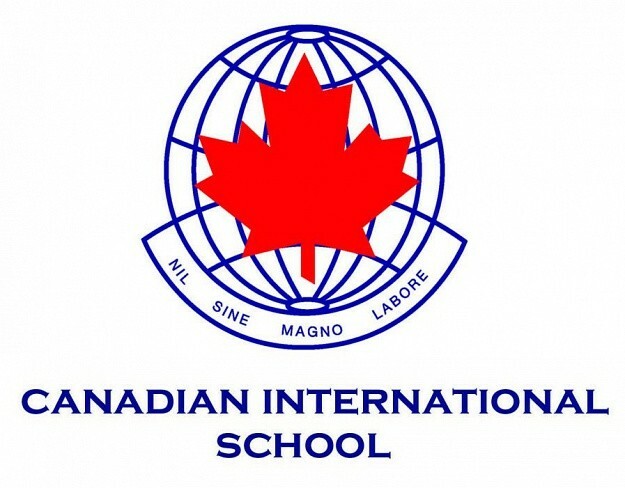 Lamdon School-Disket / Site of the 2011 Himalayan Vision Project camp. The first step was to triage every patient. 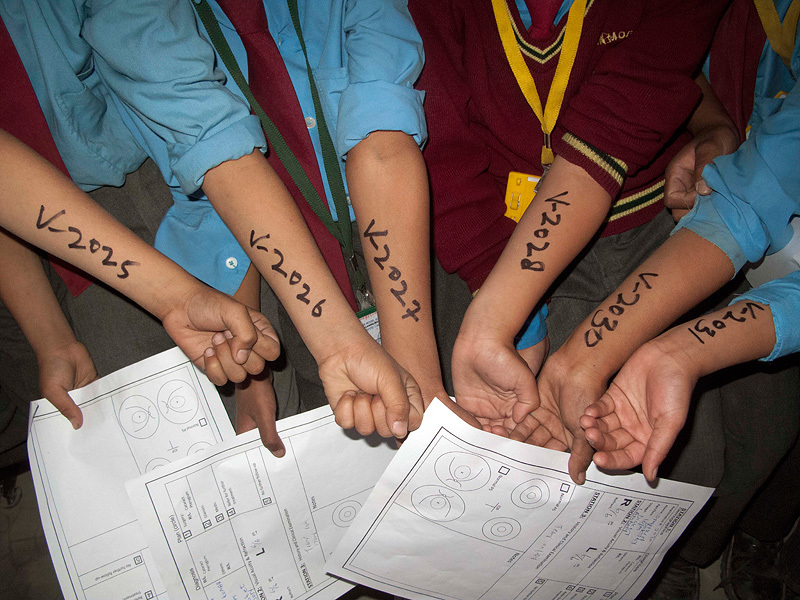 Each patient had to fill out a form and was given a number so that they could move through the separate examination and treatment stations of the camp and also so we could keep permanent records for follow-up treatments and eyeglass distribution. The system worked very well. Then everyone was given a basic eye acuity exam. Here Dr Nordan and the head of the optometry team Dr James Chong, train the volunteers who administered the preliminary vision exams. Patients were then given a more thorough examination for cataract conditions, glaucoma or injuries due to illness or accident. Depending on the results of those examinations, the patients were given medications, registered for cataract surgery or sent to be measured for reading or prescription eyeglasses. 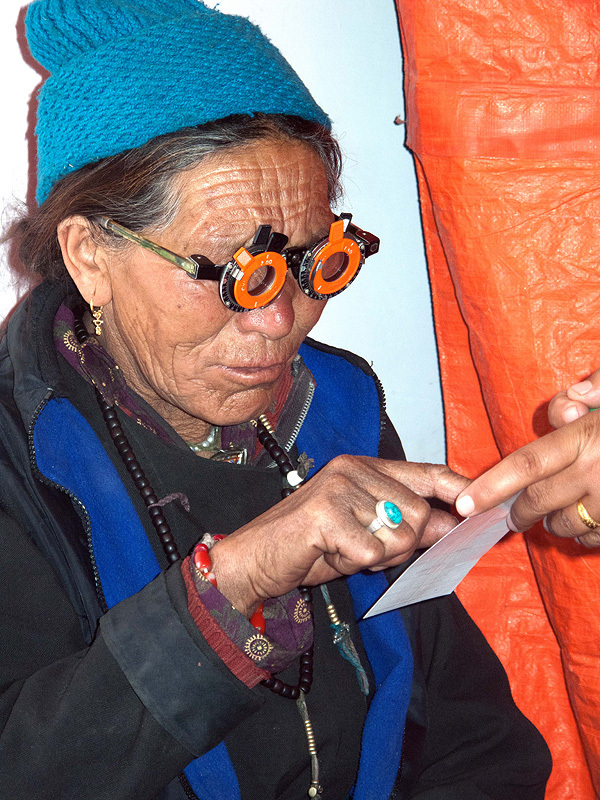 A vital member of the Himalayan Vision Project team Mrs Pennie Jackson and a local volunteer measure a woman for reading glasses. A very generous supporter in Singapore, Mrs Wong Sioe Hong, donated several thousand pairs of reading glasses which helped the team restore the practical eyesight of many men and women over 40 years of age. 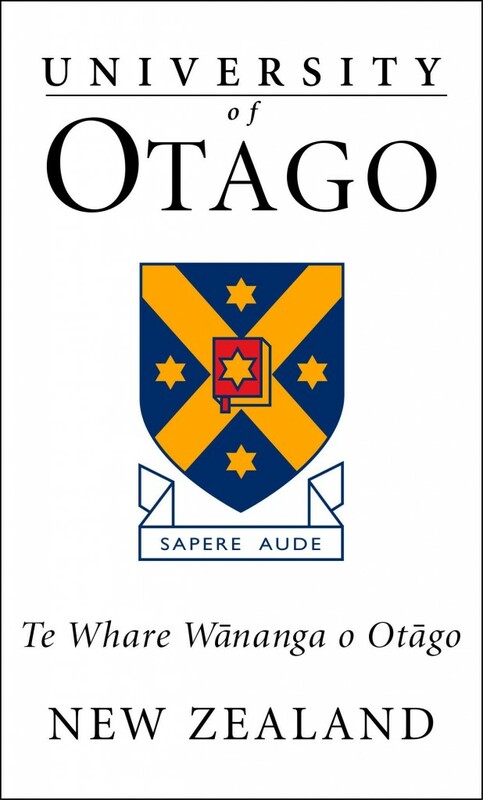 Perhaps the most dramatic and cost effective intervention was that in the field of optometry. 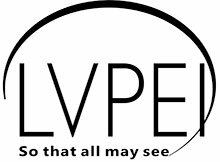 Dr James Chong and his team examined and measured hundreds of people during the camp and found many people, young and old, who could greatly benefit from correctly prescribed custom eyeglasses. 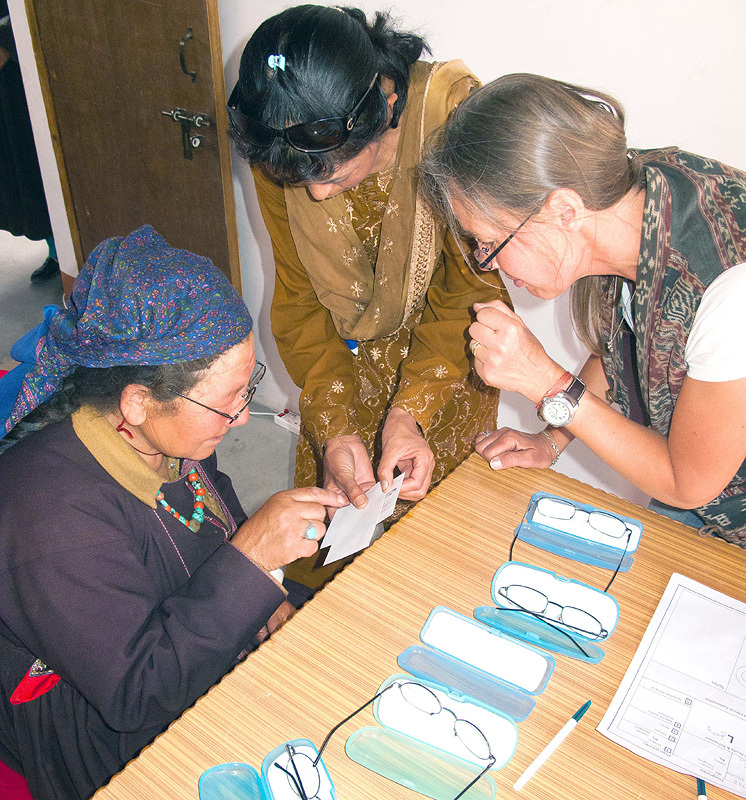 Over 275 patients were finally measured for prescription eyeglasses. 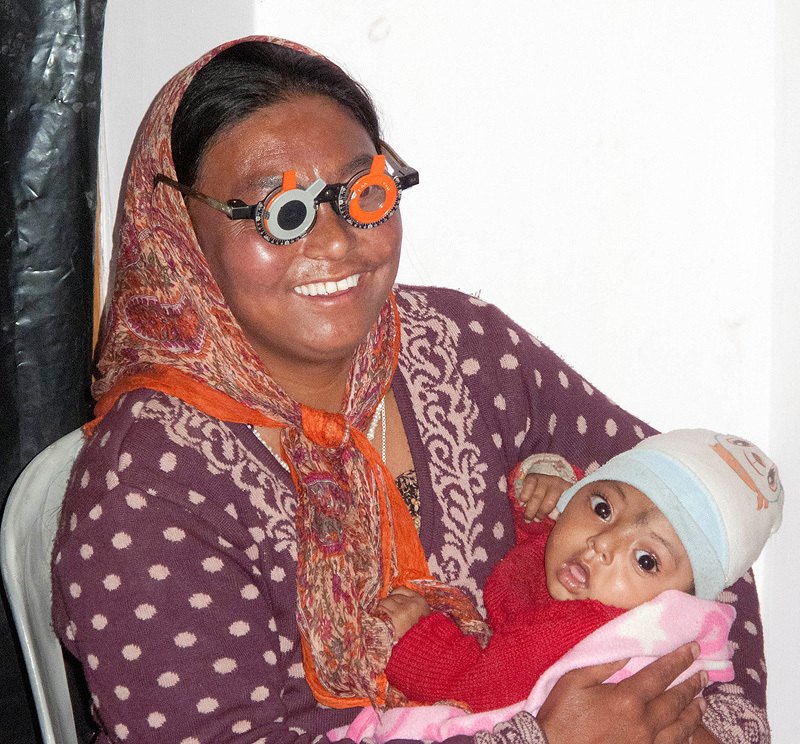 The order was placed with GK Optical Company in New Delhi and then returned to the patients in Nubra Valley in less than three weeks. 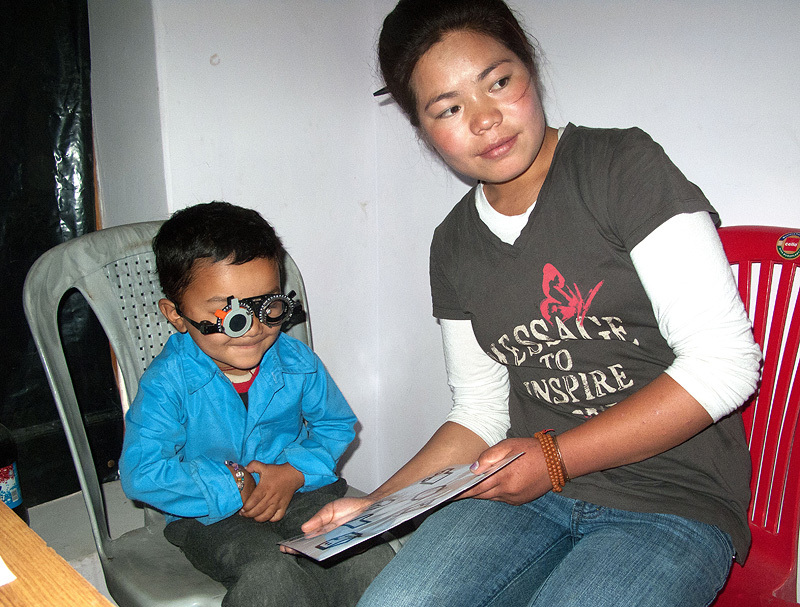 As a result of the accurate patient records kept during the camp, each pair of prescription eyeglasses were distributed to their very happy new owners by Dr Nordan before the onset of winter. 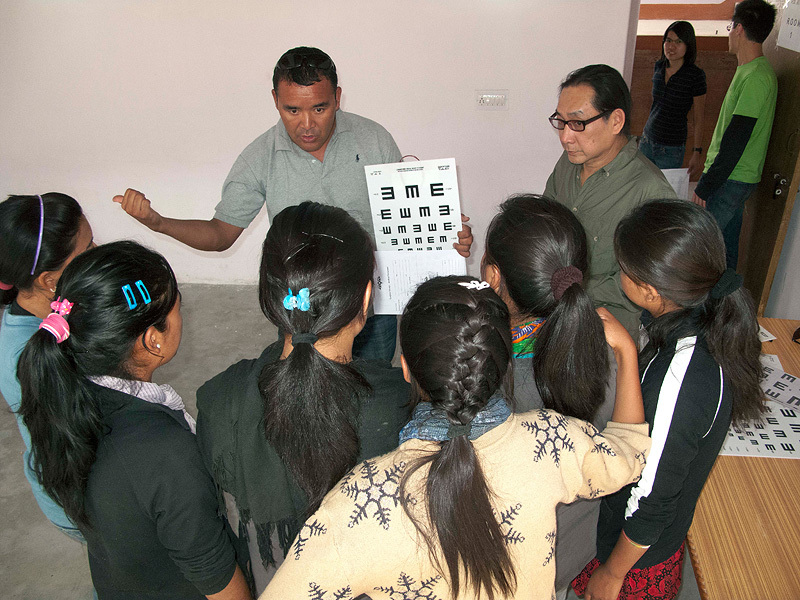 Many of the patients went from functionally blind to fully restored vision as a result of their new eyeglasses. 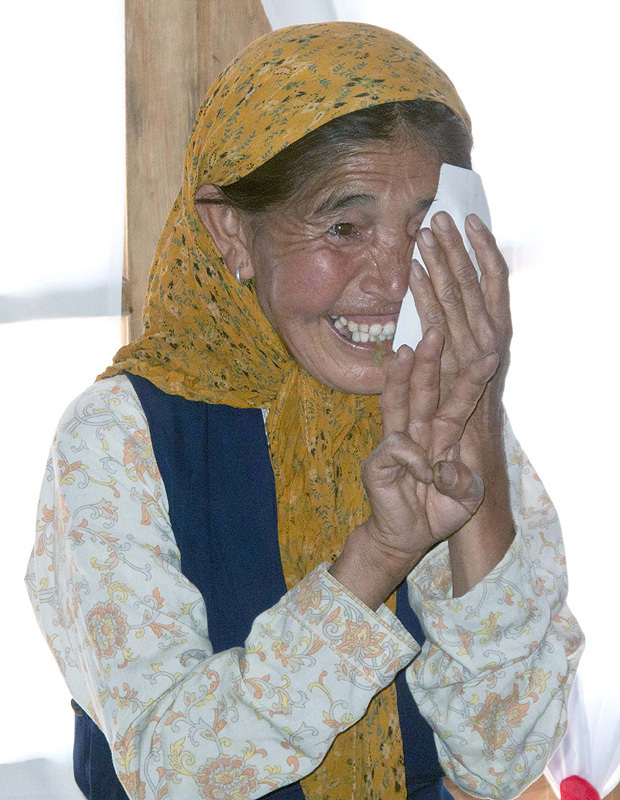 With the help of our friends and supporters Mr Jatinder Dhingra and Mr Rajesh Kumar in Delhi, who coordinated the deliveries, the 275 pairs of eyeglasses were perfectly fabricated and returned to Ladakh in less than three weeks. Dr Nordan then was able to distribute them to the patients and perform a basic eye test to confirm the dramatic improvement they brought to each patient. 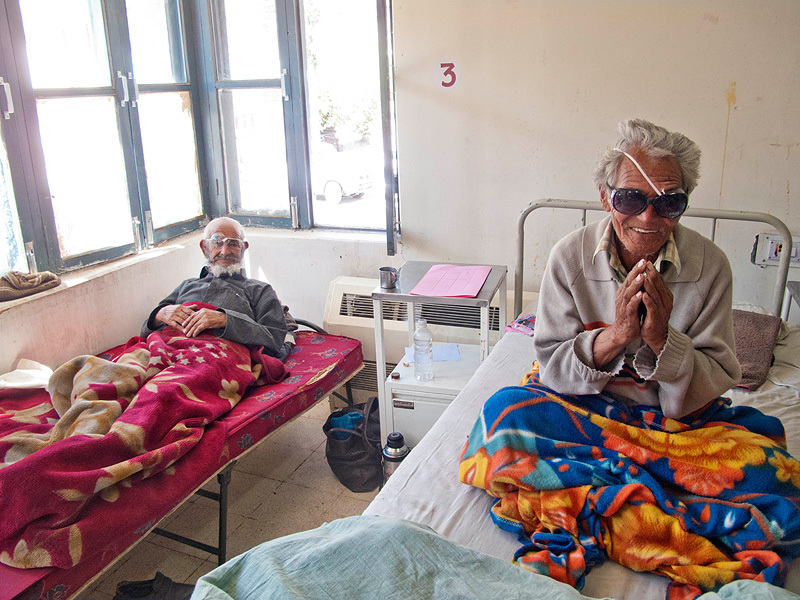 Other patients required surgery for their cataract conditions. The skilled surgical team of Dr Pauline Cheong, Dr Romesh Angunawela, Dr Marcus Ang and Dr. Jod Mehta, along with the seamless support team led by Sister Low, performed 37 sight restoring cataract operations. 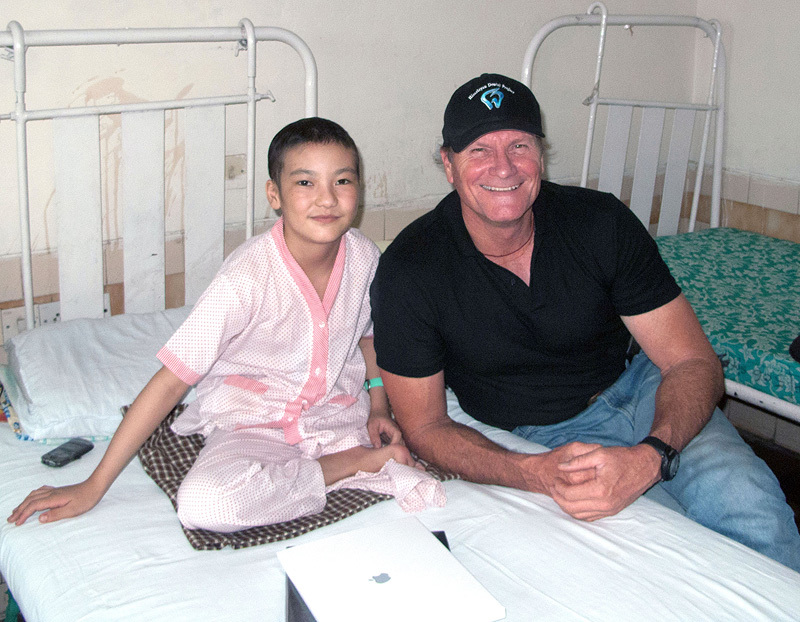 The gratitude of the patients was heartwarming and inspirational to the entire team. 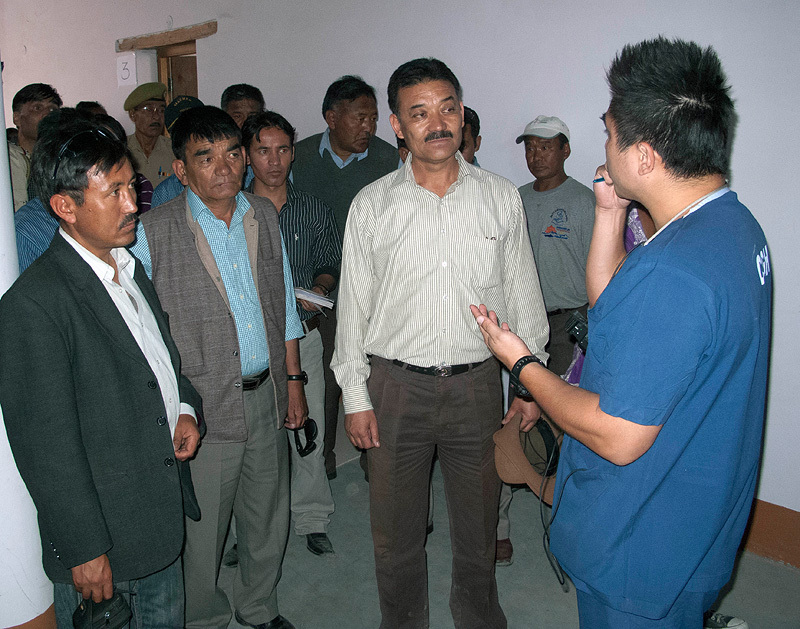 The Chief Executive Hill Councilor Mr Ringzin Spalbar as well as the Councilor for Health of Ladakh, Dr Wangchok paid an official visit to the camp and expressed the gratitude of the local government to the team for the benefits they brought to their constituents. 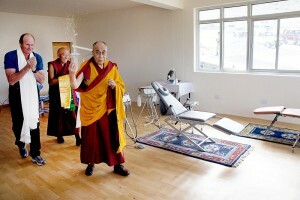 To continue the progress and momentum established by the international vision health care teams that have come to Ladakh over the last four years, we are now moving towards the next level of progress. 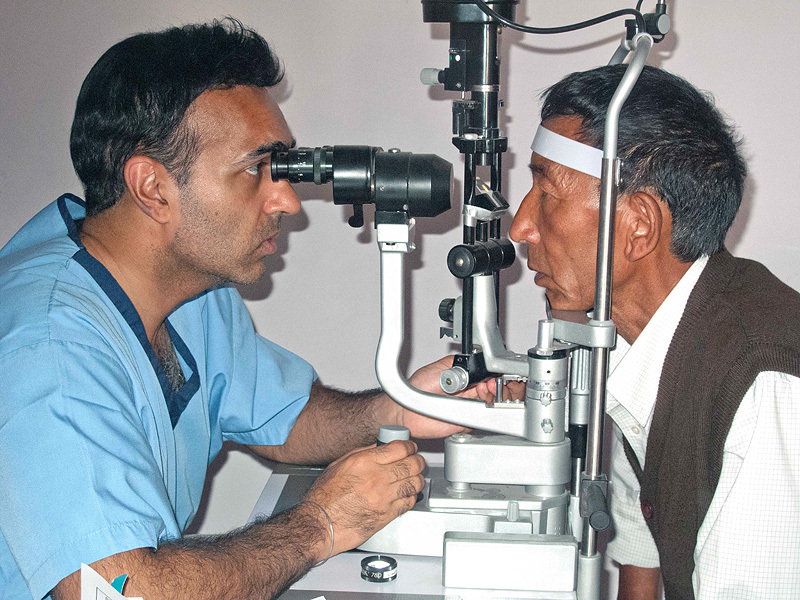 In conjunction with the world renown Tilganga Institute of Ophthalmology in Kathmandu, Nepal we are now sending students and health care workers to TIO for training in basic vision health care. After completion of their training, the students will return to Ladakh to work with The Himalayan Vision Project and endeavor to bring adequate vision care to virtually every remote village in Ladakh. 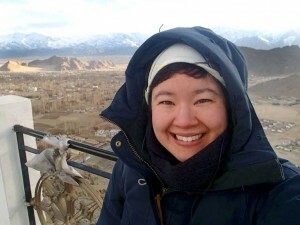 The dedicated nurse and dental technician at Lamdon School in Leh, Mrs Yangchan Dolma is now studying at TIO and will return to Ladakh with greatly enhanced skills to help the people of Ladakh. The team also included two dedicated physicians who examined hundreds of patients for a wide range of general maladies. 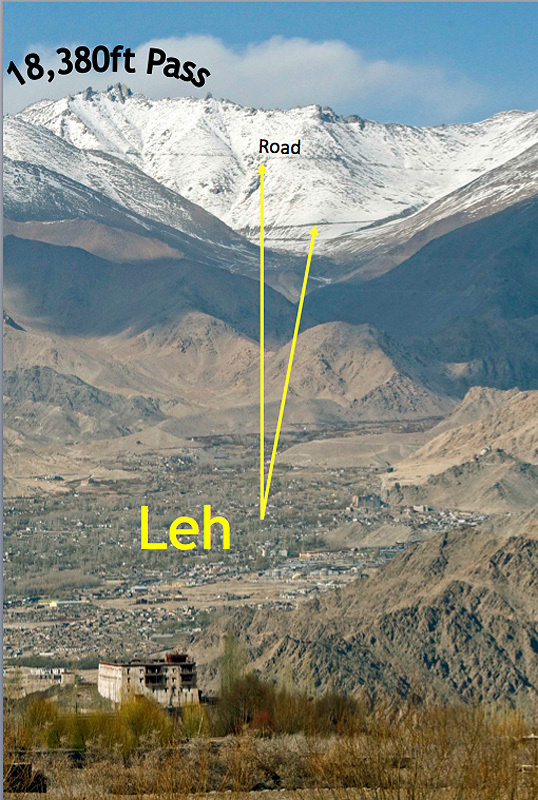 One of the most common ailments found was degenerative arthritis caused by a lifetime of climbing the mountainous terrain of Ladakh. 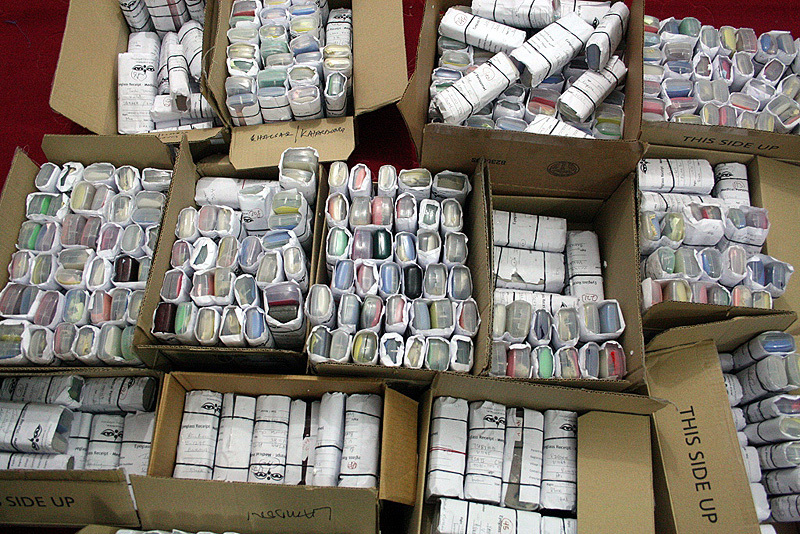 The doctors prescribed 175 knee braces and walking sticks for some of the most severe cases and we will purchase them and have them delivered to the patients in the spring of 2012. 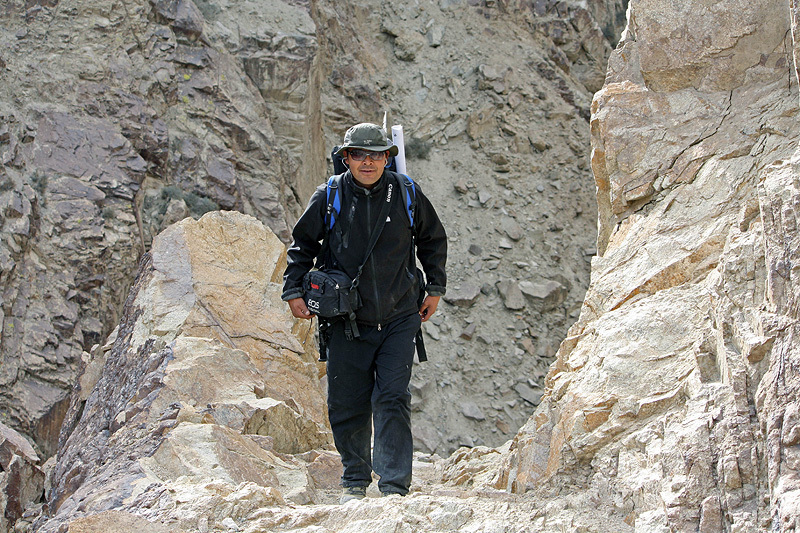 Erik Koto’s documentary on the 2011 Nubra Valley medical dental expedition.